My first taste of the Middle East took place over a few years ago – a stopover in Doha, Qatar, on the way back from the Maldives, did make me curious. Very curious. So earlier this year, I decided I would go back to this part of the world, but not make it a stopover – it would be a destination in itself. A BBC documentary on the region sealed our fate – we were going to spend Easter in this part of the world. It had everything that we were actually looking for: nice warm weather, interesting food, stunning hotels and certainly a different cultural experience. 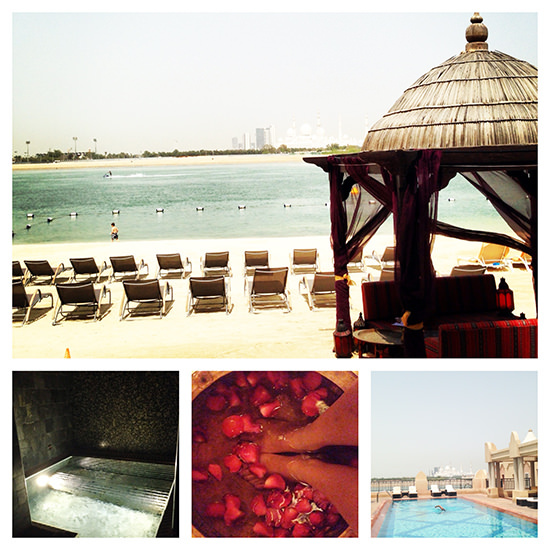 Abu Dhabi seemed to offer everything we wanted. And to top it off? 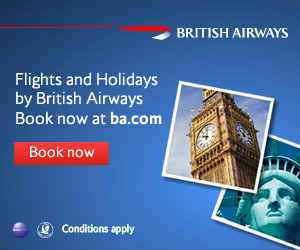 The perfect flight times with British Airways, on the days we wanted, right over Easter – another sign. Abu Dhabi was more than I expected. Photos by Bernard Richardson for Flytographer. As this was a region I knew pretty much nothing about (I had actually resisted visiting this part of the world), some research was needed – so I asked my lovely readers and social media followers (on Facebook and Twitter) what was I supposed to do, and, most importantly – where to stay. 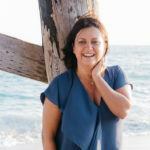 Having a blog and building a community goes both ways – my readers travel the same way I do, and between all of us (just a few thousand!! 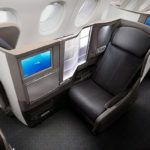 ), we certainly clock up enough business class miles and five-star hotel stays. The response was overwhelming – many of them knew the region well, and there were some very strong opinions about ‘which was the best place to stay’. A lively debate followed, and I had to make a decision – I would have to try 3 different Abu Dhabi experiences over 5 nights. 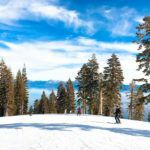 It can be a pain to switch hotels (and pack and repack), but looking back, it was the best decision to make. 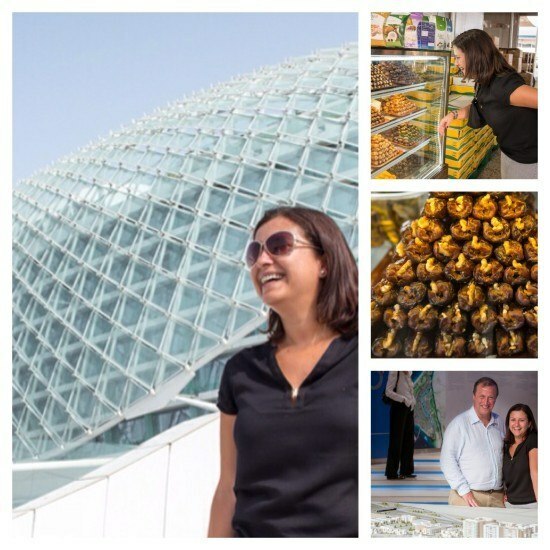 I had a fantastic (and very diverse time) in Abu Dhabi, and loved every minute of it. To make things easier (in the packing department), I decided this was the ideal time to test First Luggage‘s service – I was to fly without any luggage. Exactly! 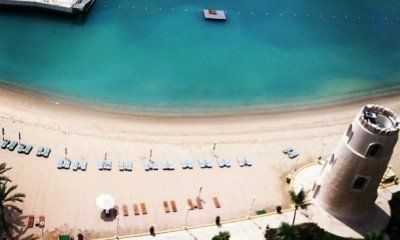 Our Tumis would go ahead of us and would be delivered to our first hotel: the Shangri-La Qaryat Al Beri Abu Dhabi. I have to confess it did feel strange (I had to pack 4 days before the departure date, just as I landed and unpacked from Paris), but very liberating. My luggage pick up did not take place at the scheduled time, but once the bags were gone, I had nothing to worry about – and I knew they had arrived at the hotel before I even got on the plane. Amazing stuff. After a 7h flight (which for the first time ever in my life was eventful – we had really badly behaved passengers in our cabin, who overindulged on the alcohol on offer and would not stop kicking our seats and having a little party of 4 as if they were at home with friends… where the situation was actually very poorly handled by the BA crew), we arrived at Abu Dhabi airport and were met by our driver (I had a private transfer booked through Viator). And in 15 minutes, we finally arrived at the hotel. Our first impressions were very good – the style of the building was in accordance to the location, we certainly did not feel we were in a Western hotel. We loved our deluxe room which offered great views of the channel where the hotel is located and were starving, so we made our way to the Vietnamese restaurant where we had an incredible meal. Although it was 11pm, we weren’t tired due to the time difference (2h ahead of the UK), so we headed to the bar. I cannot tell you how surprised we were to meet some fellow passengers (who had witnessed the little incident and offered their sympathy) – but even better, we saw *that* couple, who at this stage were as quiet as mice. We headed to the hotel’s rooftop bar (Caviar & Pearls, no less) and had a brilliant night out with our new friends (read: 2.30am), as we kind of gatecrashed a wedding party. I say kind of as we were allowed to be in the rooftop bar as hotel guests, but also we were the only ones not dressed for a wedding. Oh well. Oh, what a nice view in the morning! 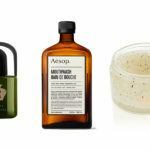 I also got to try the Spa, which was outstanding. Mr. O chose to spend some time at the beach. I always find it very weird to arrive to a hotel in the dark, as I am never quite sure what to expect in day light. And although we were really happy with what we had seen in the dark, we weren’t quite ready for the daylight effect. The hotel was very well-kept and could be a real destination in itself (most people we met were staying there for a week or so), providing the perfect ‘close to town, resort experience’. I spent the morning at the spa, where I had a signature massage, while Mr. O chose to explore the beach and the pool – it is always nice to have some ‘me’ time, and we were reunited at lunchtime. Our afternoon was to be very different – and I cannot tell you how much I was looking forward to it. Viator had invited us to experience its private ‘Abu Dhabi Highlights Tour’, which takes 4-4.30h, originally aimed at cruise passengers. It is now offered to ‘normal’ visitors and it is the perfect day out. We were met by Ursula, a serial (and lovely) German expat, who has been in AD for over 7 years. We weren’t sure what to expect, but just went with the flow. We were also met by Bernard Richardson, who is the Dubai Flytographer. Dubai is only 1 hour drive away from Abu Dhabi, and we were very keen to capture the tour moments. The imposing Sheik Zayed Mosque which we visited with Viator. Photos by Bernard Richardson for Flytographer. 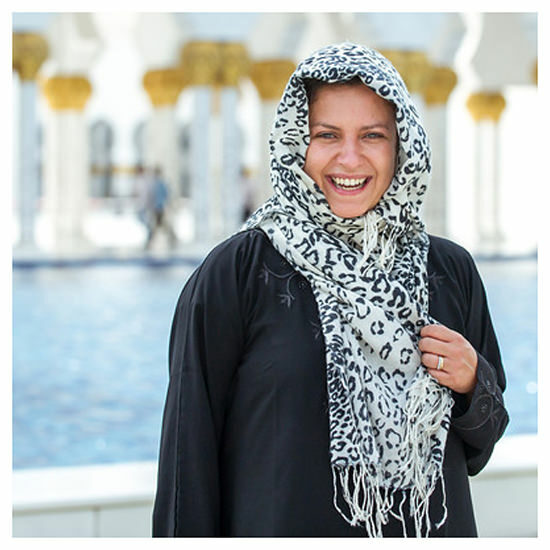 Although I was wearing trousers and had covered arms, I had to cover up to visit the Sheik Zayed Mosque. It wasn’t easy as it was 42c, but obviously, in respect for local culture, it was the thing to do. We were incredibly impressed with this work of art – beautifully designed and finished – and certainly worth a visit. Needless to say, because we had Ursula with us, we learned things that we would never would on our own. With the tour, you have a guide and a driver, and you basically stopover at some pre-defined city highlights. Abu Dhabi is incredibly spread out – there are various islands and interest points, it is not a place you can walk around (to see all these things). Setting this afternoon for the tour was one of my most inspired decisions, I must say. From the Mosque, we headed to Saadiyat Island, where we visited the Cultural Centre, which tells you what is coming up development-wise. While Dubai is the best known Emirate state, Abu Dhabi is the one with the money (oil and gas, obviously) – it has lagged in tourism development but there are certainly plans to make up for lost time. Put it this way: there will be a Guggenheim and a Louvre museum in town soon. I kid you not. (I also made a mental note to stay in this location on a future trip to Abu Dhabi, as it seems to be the perfect location for a ‘beach experience’). Next stop: Yas Island, which must be a familiar location for all Formula 1 fans. I am not particularly interested in cars, but you can’t ignore the ambition and determination of the Emiratis. From here, we went to the market. I love visiting markets and was excited to have this opportunity – and with dates being like the local currency, it would be rude not to try 2 or 3. Or 30. At Yas Island, Saadiyat and the date market with Viator. Photos by Bernard Thomson for Flytographer. Mr. O famously hates dates, but I am delighted to announce we have a new convert. Needless to say, the local dates are juicy and tender, not like what we usually get in the UK. At this stage, we had to cut the rest of the tour short, as we needed to get to our new hotel before meeting some friends for drinks. New hotel, I hear you ask? 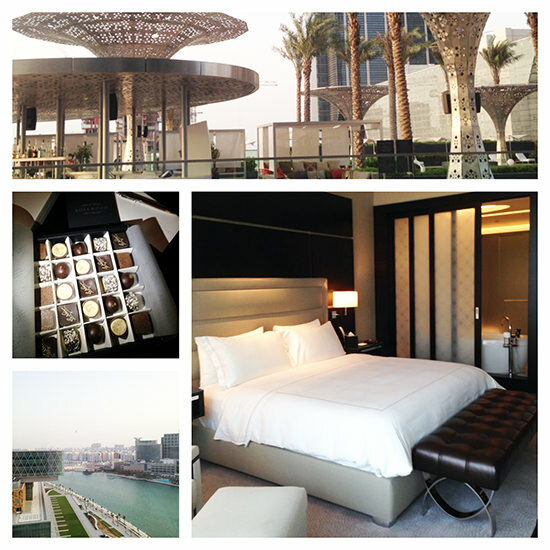 Yes, it sounds mad, but I had to try the new Rosewood Abu Dhabi. I just had to. And I have to tell you, it is one of the sexiest hotels I have been to recently. Located in Al Maryah island (which is directly across the Abu Dhabi city island), it offers a ‘city’ experience (so would be perfect for business travellers). This island is also home to a new promenade and a very nice new shopping mall, which is connected directly to the hotel – The Galleria. Very nice indeed. We met a friend’s friend (the lovely Estelle) for a drink and spent a lovely evening at the hotel. For the first (and only) time during our stay in Abu Dhabi, it was the only opportunity we had to see and spend some time with locals (aka Emiratis) – it was very interesting as there doesn’t seem to be a lot of mixing up socially. The local fashion parade was quite something. Worth noting that most of the socialising takes place at hotels due to the liquor laws (i.e. only place where alcohol is served). We had quite a few options for dinner at the hotel (which welcomes outside guests, of course), and decided on the Lebanese. It was warm, but we still decided to eat outside – we had a lovely view of the city and it was also quite busy, so there was quite a cool atmosphere. 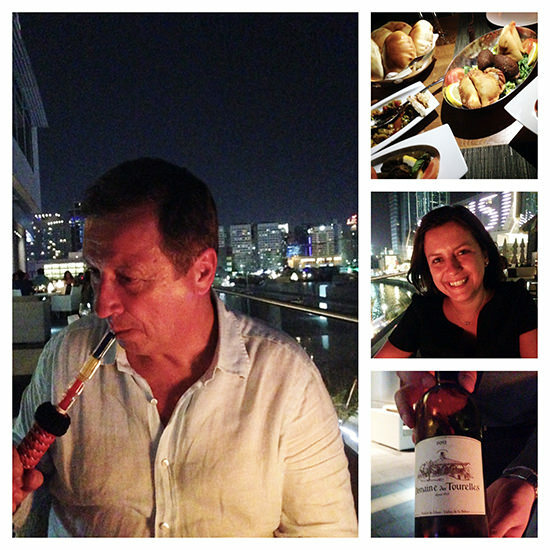 A night of firsts – shisha, of course! We stayed on course and had Lebanese wine (which we tried before and were really impressed with). One of my favourite moments? Trying some shisha. It took quite a bit of coughing – and actually trying on different flavours. I posted a video of Mr. O on instagram (it is quite funny, worth watching) and did like the flavour suggestions we got in real-time: grape and mint was our preferred one! After a lovely sleep, and a wander around the next morning, we got our car and headed somewhere very special: the desert and the stunning Qasr al Sarab resort, located a good 2h30 from the city of Abu Dhabi. The roads in Abu Dhabi are great but the drive was long: a straight road with the odd camel. But we got there in the end. 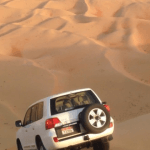 The Qasr al Sarab – a mirage? No! To say that the Qasr al Sarab by Anantara, was unique, would be an understatement. Getting a room here (as any other hotels in Abu Dhabi on these dates) was nothing short of a miracle, and I cannot tell you how happy we were to arrive. The hotel was beautifully kept and it was peaceful (although obviously you saw other people – I was surprised with how many German and Italian guests there were!) – and the rooms were out of this world. Needless to say, you are miles away from civilisation, and that is what one should look for if visiting this place. Unsurprisingly, the food and drink options were outstanding. We had a traditional BBQ in an Arabic tent which was quite fun, and yummy cocktails, I have to say. On our second day, we just lounged by the pool, which was really nice. 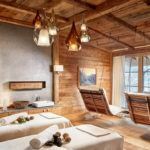 We also tried the spa (look at the view of the spa room in the photo below – the exact opposite of the Maldives, but oh so striking! ), which in hindsight wasn’t the best idea. I mean, the timing, wasn’t – and let me tell you why: because before sunset, we went dune bashing. Again. Dune bashing is a Middle Eastern national sport almost. Click on the image below and you will be taken to a little instagram video we did. No comment necessary. Let’s say I am glad I cannot show you what went on in our car. The screaming. The words.. oh well! We should have gone to the spa AFTER dune bashing, but hindsight is a wonderful thing. I stupidly did the exact same thing when I first ‘dune bashed’ in Doha. I won’t do it again, promise. We spent the rest of our stay doing pretty much nothing. We were looking for some sun, reading and just spending time together, and that was exactly what we did. It was nothing short of perfect. 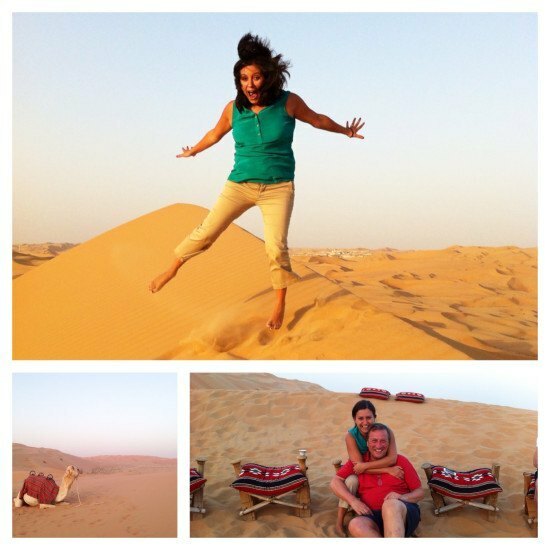 I jumped again… and we saw some camels! Before we knew it, it was time to head back to the city. But interestingly, as our flight was only at 2am (seriously, a bit strange, but not bad at all! ), I got to do something really cool: meet one of my longtime readers and social media ‘friend’, a fellow Portuguese, also called Ana and her boyfriend. Ana lives in Dubai, but knowing we were coming so close, offered to come and meet us and organise dinner and drinks. It was a fantastic evening, and we loved every minute of it. 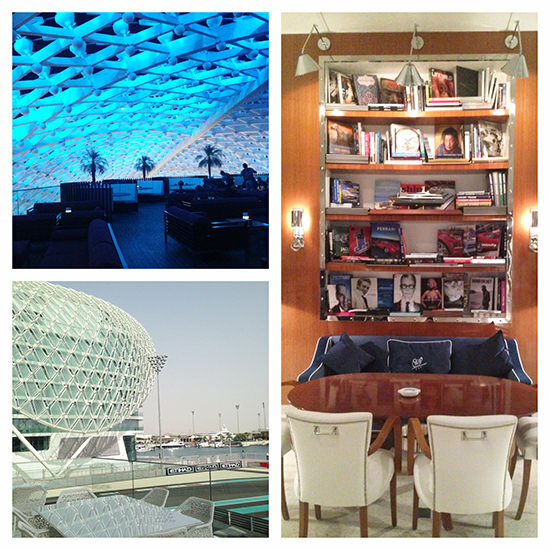 We were to return to Yas Island and meet for drinks at Skylite at the Yas Viceroy hotel (very cool bar!) and then head for dinner at the fab Cipriani in Yas Marina. I was gutted that we didn’t actually take a photo together – we were too busy talking! But that just means we have to do it again. Before we knew it, it was almost midnight and time to head to the nearby airport, and fly home. We were back to normal BA service and had a brilliant flight (and slept like babies, before our 6.30am landing). Our Easter break in Abu Dhabi was exciting, relaxing and certainly interesting – we did a lot, but we also had enough down time, so we arrived back to London refreshed and (almost) ready for real life. I was intrigued about this part of the world, and I am glad I took the time to explore a tiny bit of it, and not just treating it as a stop over. Goodbye Abu Dhabi, you were lovely! But what I will never forget? The stunning sunsets. And the sweet mint ice tea. PS. And we have been back quite a few times since. 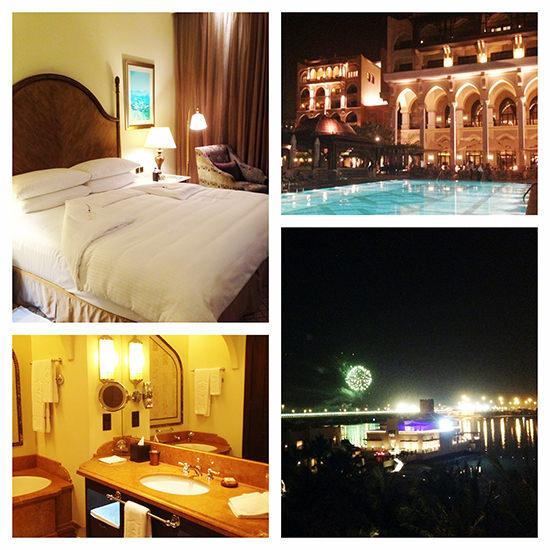 Here are 3 Emirates you should visit. Disclaimer and fact box: I would like to thank all of those who made this trip possible in a relative short time, and within one of the busiest travel dates of the year. 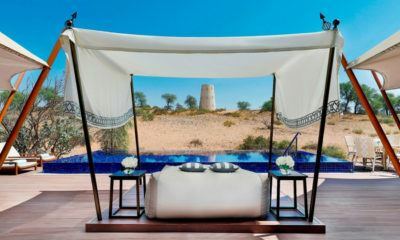 I loved the 3 hotels I visited on my stay – I was a guest of the Shangri-La Qaryat Al Beri (room rates from £280), and the Rosewood Abu Dhabi (room rates from £200) and paid a discounted media rate at the Qasr al Sarab (room rates from £300). Our Abu Dhabi Airport Private Transfers to our hotel cost £58 for 2 and our private Private City Highlights Tour cost £165 for two people, both provided by Viator. First Luggage kindly took our luggage from our home in the UK to our Abu Dhabi hotel at a cost of £172 door to door. A 30kg bag from London to NYC or LA costs £125. First Luggage’s sister company, LuggageDeliveryCompany.com, provides return luggage delivery as well, starting at £47 one-way (UK to Italy), which is comparable to any airline’s baggage fees, minus the hassle. You know I cannot travel without Flytographer, and I cannot thank them enough for making this Abu Dhabi experience happen, namely as their team is based in Dubai. A 30 minute photoshoot, on any of its 90+ locations around the world cost $250, with a 1-hour shoot costing $350. Are memories the best souvenir? I think so. Thanks for sharing this great review! Next year I may have a chance to attend the business trip to Abu Shabi, for sure I’ll do my best not to miss the opportunity! Great post ! Visiting Abu Dhabi in couple of weeks. Can’t wait. Some inspiring places to stay and visit ! Thank you! Absolutely worth a visit! 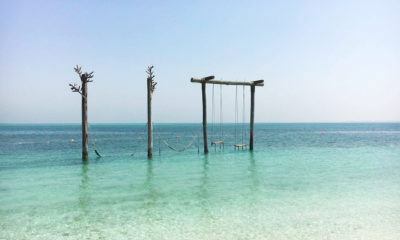 I have not yet made it to the Middle East, but this definitely makes me want to go! 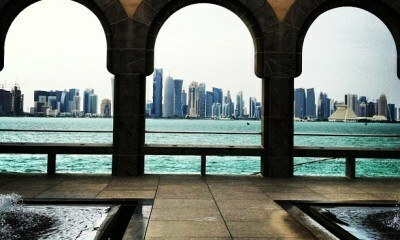 you visits to Doha and Abu Dhabi really do make me want to visit this part of the world. i’ve definitely been a little skeptical up to now! we loooved following you on this trip, mrs. o! we’re also big fans of switching up hotels during a trip. it can definitely be a pain, but it’s a great way to experience a new neighborhood and see different things during a short time. we want to join you on your return! It was this trip that put me over the Flytographer edge. I don’t just love the way you travel, I love the way you capture. And that shot of Mr. O with the pipe is the very best ever. The middle east is at the top of my bucket list-as always you are inspiring me! Oh thank you. I honestly think you would love the Middle East. It was an amazing trip. I love following your fun adventures. This looks lovely all around and you and Mr. O look like you had a wonderful time. I last visited this part of the world 7 years ago and it wasn’t quite like this. At all. I’m due a trip to Dubai for work, so I think I may extend it a couple of days and explore AD as it seems so interesting. Love rosewood hotels. And that desert place, yes! It’s a place I’m very curious about too and from looking at your photos the hotels, scenery and the architecture look gorgeous! Quite busy but I would imagine the opposite of Dubai. Very pretty parts indeed. It looks like you had such an incredible time. I loved following your photos on Instagram and those ones captured by Flytographer are beautiful. I’ve never been interested in visiting Abu Dhabi but the more I read about it the more tempted I am! Another great post. What’s nice is that even though you go to these fancy places, there is a sense or really down to earth quality about you. You don’t seem fazed at all. I was particularly interested in this one as we were offered a job there last year and considered moving for a while. But in the end, we decided to stay in the UK. Nice to see what could have been (although obviously living as an expat is not the same as travelling as a tourist). Stephanie, oh yes, it could be quite different, but it is an interesting place – I know quite a few people living there and it is fascinating to hear their stories. oh! i think you are in for an adventure and a half!! I read every single one of your posts but I’m such a lazy commenter usually. I felt I had to comment on the stunning images and amazing trip this looked like it was. Your blog gives me such wanderlust, I have so many places on my Bucket List! If you were to pick just one place to save up for – what would it be? I’m having trouble deciding! I’m off to Amsterdam and possibly Athens this summer, but I’d love to book another little getaway! Oh Scarlett, thank you, that is so kind of you. The question you ask: it is like asking a mother to pick a favourite child! Depends on what you want – city? beach? countryside? I can’t tell you how much I enjoyed this short trip. I loved The Mosque and the whole tour of AD and as for going to the desert that was amazing as was the sunset we did whilst dune bashing. Love the video clip! We we be back to UAE to explore more. I really enjoyed your article, having recently been to Abu Dhabi. We wished that we had time to visit Qasar al Sarab, but maybe next time. 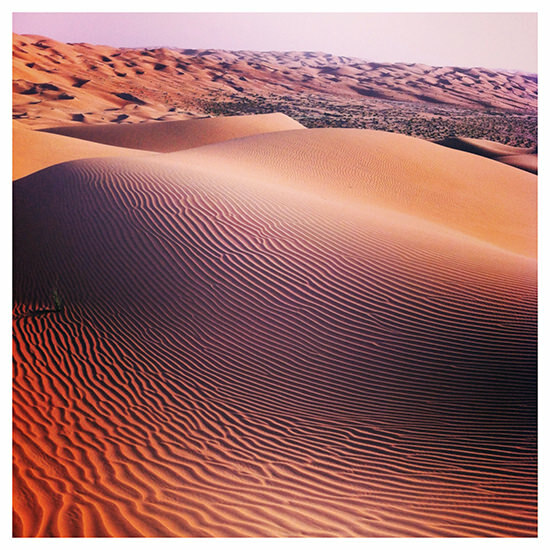 Your picture of the ripples in the desert sand is stunning! Oh yes, worth a visit! Thank you for your kind words!